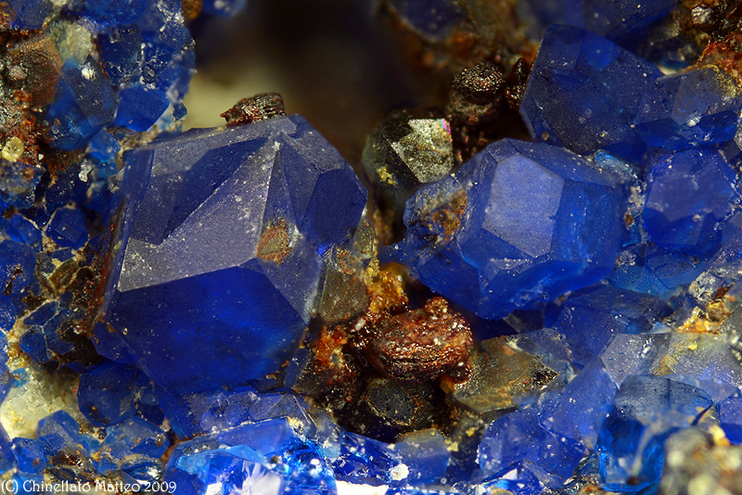 Lazurite: Mineral information, data and localities. Often there is minor K substituting for Na. The IMA takes the ideal formula with S as the dominant anion and not sulfate, from Hassan et al. 1985, but even that reference indicates that sulfate is dominant, making Lazurite either a sulfide rich variety of Hauyne or just a theoretical endmember of a series with hauyne. From the Persian "Lazhward" for "blue." Also for its dark blue color resemblance to "azurite." Both Lazurite and azurite derive from "Lazhward". Dana (System of Mineralogy, 1868) considered lapis-lazuli to be the dark blue mineral in the lazulite-calcite rock of the same name, but these were renamed lazurite in 1891 Brögger W C, Bäckström H 1891. 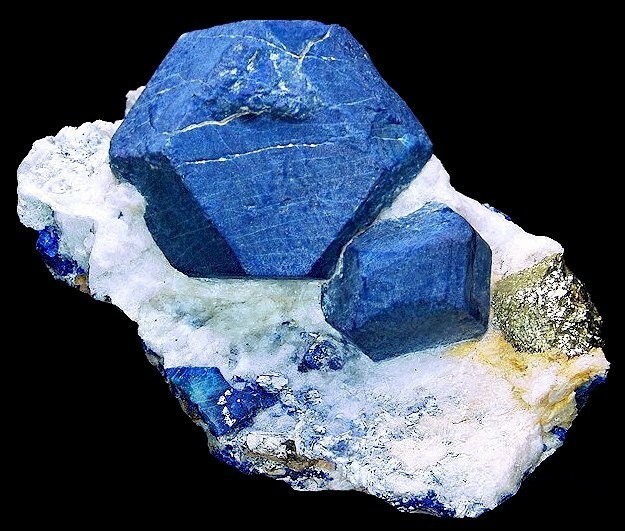 Lazurite is the blue component of the 'gemstone' (or, more usually, decorative rock) Lapis Lazuli, which is a lazurite-calcite-pyrite rock that has been mined as a gem material for some 9,000 years. Dana (System of Mineralogy, 1868) actually considered lapis-lazuli to be the dark blue crystals in this rock, but these were renamed lazurite in 1891 Brögger W C, Bäckström H 1891. However, all lazurites analysed to date represent only sulfide-rich varieties of Hauyne and not a separate species.Moore & Woodside, 2014 It probably needs redefining via the IMA; until then it formally remains as a hypothetical sulphide rich endmember of a series with hauyne, and all existing specimens labelled as sulphide-rich hauyne. It is an ultramarine- to midnight-blue, opaque, and non-fluorescent mineral with a bright blue streak. Some blue green and green "lazurites" (hauynes) have a small unit-cell edge. Since S is smaller than SO4, these were mistakenly thought to be probably dominant in sulfur. These "lazurites" are translucent and fluorescent under long-wave UV and have a white streak just as hauyne has. The name lazurite should not be applied to the small-cell green hauynes. Lazurite and hauyne are members of the Sodalite Group, in the feldspathoid family. The two sodalite cages in lazurite contain (Na,Ca)4(SO4,S3,S2). The situation is analogous to Hackmanite which is a sulfide-rich variety of sodalite. It is difficult to determine the oxidation state of sulfur in a sodalite cage. S, S2, S3, S4, SO3, and SO4 have been suggested.Tauson et al. 2003 ,"Fleet et al., 2005. A possible triclinic dimorph (?) is known: UM1976-26-SiOSO:AlCaClHNa. Compare this with Vladimirivanovite and the polytpe Lazurite-O. Lazurite-C is a monoclinic polytype. Visit gemdat.org for gemological information about Lazurite. Based on Brögger W C, Bäckström H 1891 the name lazurite was grandfathered by the IMA who later gave it Hassan's ideal formula, Na3Ca(Si3Al3)O12S Hassan et al. 1985. The data used by Hassan all came from hauynes with approximately Na6Ca2(Al6Si6O24)(SO4,S,Cl,OH)2 as no sulfide-dominant mineral required by Hassan's formula has been observed to date. The situation is similar to sodalite and hackmanite. In sodalite Cl is the dominant cage filler and an ideal hackmanite would have S as the cage filler. Though S readily substitutes for Cl in sodalite, no sulfide-dominant species has ever been on observed. On that basis hackmanite never was approved, avoiding the approval of a hypothetical mineral. The situation has been reversed with lazurite and hauyne. What has been commonly called lazurite all has dominant SO4 and is sulfide-rich hauyne, just as all hackmanites are sulfide-rich sodalites. Dodecahedrons, cubes, granular, disseminated, massive. Has monoclinic (Lazurite-C) and triclinic polymorphs (Vladimirivanovite, UM1976-26-SiOSO:AlCaClHNa, Lazurite-o and modulated structures. Modulated green Lazurite from Baffin Island ( Hassan et al (1985)) and Ladjuar Medan ( F. Camara ( 2009) Priv. Comm.) both have a cell edge of 9.05 A. In calcic skarns and marbles at Sar-e-Sang. Calcite 75 photos of Lazurite associated with Calcite on mindat.org. Pyrite 54 photos of Lazurite associated with Pyrite on mindat.org. Phlogopite 45 photos of Lazurite associated with Phlogopite on mindat.org. Afghanite 21 photos of Lazurite associated with Afghanite on mindat.org. Diopside 11 photos of Lazurite associated with Diopside on mindat.org. Marble 8 photos of Lazurite associated with Marble on mindat.org. Bystrite 6 photos of Lazurite associated with Bystrite on mindat.org. Thomsonite-Ca 6 photos of Lazurite associated with Thomsonite-Ca on mindat.org. Gonnardite 4 photos of Lazurite associated with Gonnardite on mindat.org. Albite 4 photos of Lazurite associated with Albite on mindat.org. The opaque ultramarine and midnight blue varieties are not fluorescent. The translucent green and blue hauynes have an orange brown fluorescence under Long Wave UV. Fischer, H. (1869) [Resultate seiner microscopisch-mineralogischen studien]. Neues Jahrbuch fuer Mineralogie 1869, 344-347. Zirkel, Ferdinand (1873) Die mikroskopische Beschaffenheit der Mineralien und Gesteine. Verlag von Wilhelm Engelmann, Leipzig, page 165. Vogelsang, Hermann (1873) Über die natürlichen ultramarin-verbindungen, Med. Akad., Amsterdam, v. 7, page 161. (See also Über die natürlichen ultramarin-verbindungen, Max Cohen & Sohn, Bonn, pp. 39. Brögger W C, Bäckström H (1891) Die mineralien der Granatgruppe. Zeitschrift für Krystallographie und Mineralogie, 18, 209-276. Voskoboinikova, N. (1938) The mineralogy of the Slyudyanka deposits of lazurite. Zapiski Vserossiyskogo Mineralogicheskogo Obshchestva: 67: 601-622 (in Russian). Hogarth, D.D. and Griffin, W.L. (1976) New data on lazurite. Lithos: 9: 39-54. Hassan, I., Peterson, R. C., and Grundy, H. D. (1985) The structure of lazurite, ideally Na6Ca2(Al6Si6O24)S2, a member of the sodalite group. Acta Crystallographica: C41: 827-832. American Mineralogist (1991): 76: 1734. American Mineralogist (1993): 78: 849. Tauson, V.L. and Sapozhnikov, A.N. 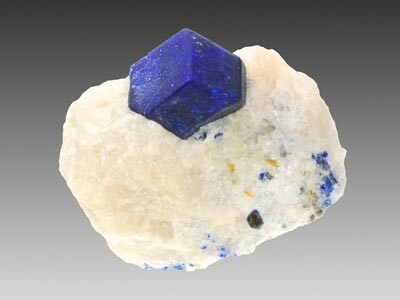 (2003) Nature of lazurite coloration. Zapiski Vserossiyskogo Mineralogicheskogo Obshchestva: 132(5): 102-107. Fleet, M. E., Liu, X., Harmer, S. L. and Nesbitt, H. W. (2005) Chemical state of sulfur in natural and synthetic lazurite by S K-edge XANES and X-ray photoelectronic spectroscopy. Canadian Mineralogist: 43: 1589-1603. Moore, T.P., Woodside, R. W. M. (2014) The Sar-e-Sang Lapis Mines. Mineralogical Record 45(3): 281-336. The following Lazurite specimens are currently listed for sale on minfind.com. ⓘ Pitwak Mine (Pitwik Mine) ? N.R. Goodman, "Gypsum in Nova Scotia and its Associated Minerals," Geology of Canadian Industrial Mineral Deposits, 1957. Identified by Mineral Associates Inc. See message thread in external links for this locality. Serafimovski, T., Volkov, A. V., Serafimovski, D., Tasev, G., Ivanovski, I., & Murashov, K. Y. (2017). Plavica epithermal Au–Ag–Cu deposit in eastern Macedonia: Geology and 3D model of valuable component distribution in ore. Geology of Ore Deposits, 59(4), 296-304. Pavel M. Kartashov data; Aleksandrov, S. M., & Senin, V. G. (2006). Genesis and composition of lazurite in magnesian skarns. Geochemistry International, 44(10), 976-988. Rogers, Austin Flint (1912), Notes on rare minerals from California: Columbia University, School of Mines Quarterly: 33: 377; Surr, Gordon (1913), Lapis lazuli in southern California: Mining and Engineering World: Dec 27, 39: 1153-1154; Rogers, Austin Flint (1938b), Lapis lazuli from San Bernardino County, California: American Mineralogist: 23: 111-114; Pemberton, H. Earl (1983), Minerals of California; Van Nostrand Reinholt Press: 367-368. Rogers, Austin Flint (1912b), Notes on rare minerals from California: Columbia University, School of Mines Quarterly: 33: 377; Surr, Gordon (1913), Lapis lazuli in southern California: Mining and Engineering World: Dec 27, 39: 1153-1154; Rogers, Austin Flint (1938b), Lapis lazuli from San Bernardino County, California: American Mineralogist: 23: 111-114; Sharp, W.E. (1959) Minerals from Los Angeles County, California. Printed privately, Los Angeles, California: 43; Sinkankas, J. (1976) Gemstones of North America II. Van Nostrand Reinhold Co., New York: 323; Pemberton, H. Earl (1983), Minerals of California; Van Nostrand Reinholt Press: 367-368. Meck, M. L., Atlhopheng, J., Masamba, W. R. L., Ringrose, S., & Diskin, S. (2011). Minerals that host metals at Dorowa rock phosphate mine, Zimbabwe. Open Mineralogy Journal, 5, 1-9.